Living on an island has its benefits…if there is ever a zombie apocalypse on the mainland, we should be pretty safe. But that bit stretch of water that keeps us safe from brain eating zombies is also one of the main reasons we miss out on so much down here…great beers, concert tours and of course, our own footy teams! But I digress…I don’t want to get all down in the mouth cos we don’t have an AFL team, no, because recently we got some awesome news. I mean, Tasmanian's were excited when we got direct flights to Adelaide, but how excited do you think we were when Virgin put their hand up to say they would start flying us all the way out West, direct! Happy days! For us Tasmanian beer lovers, it opens up so many brewery visiting side tours on family holidays…Nail, Rocky Ridge, Little Creatures, Mash, Colonial…the list goes on and on. But what about those Western Australians wanting to take a family holiday somewhere other than Bali (you know you guys love it), come to Tassie and taste some great beer. Lord knows the Craft Beer in Bali is pathetic, so why not just swap your boardies for a puffer jacket and head South East? Which brings me to the point of this article. If you are coming this way, you need to get amongst the local craft beer scene and try as many as you can. Oh wait, before I start, let me just apologise that I haven’t listed every Tassie brewery. There is some great beer being made down here, but I don’t have time to list them all. I have concentrated mostly on Southern breweries, as the direct flights come into Hobart, so I assume that people may spend most of their time in the South of the island. Unfortunately Will Tatchell doesn’t do brewery tours, because his brewery is set on an amazing farming property. Will is at the forefront on paddock to glass brewing in this country and produces some really amazing beers. Beer to try: Max, Edward, or Claude. Whichever of his estate ales are in season…these are brewed 100% with ingredients from his own farm, and they are amazing. I’m not doing too well with breweries to visit, and this one is the same, Spotty gypsy brews out of Last Rites. There are plans for a brewery at some stage, but at the moment you will have to find them on tap at one of the local establishments, or in their very cool looking cans. Beer to try: Just try and walk past their West Coast IPA…I dare ya! Can't cry over spilled beer! Keep your energy up with a sandwich instead! Credit: Chris Cooper. These guys are leaders in the craft beer scene in Hobart. They started Hobarts iconic craft beer bar, Preachers, and then moved on to make some great beers with bizarre names. 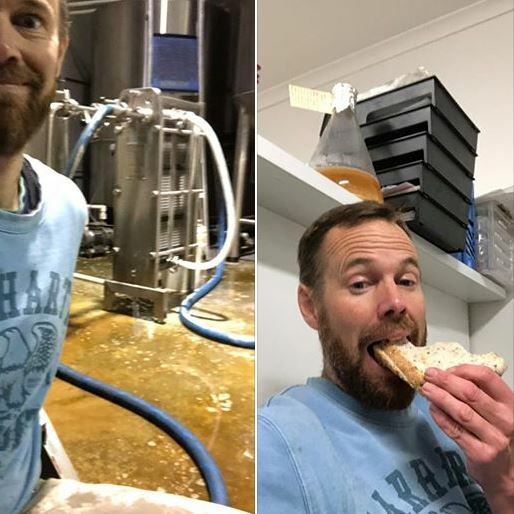 They love what they do, and it shows in their beers and social media posts – Chris posted a pic of him eating a sandwich with a floor covered in a brew accidentally spilled by him! Stu brews out of Van Dieman, so you cant visit him either. Described as the experimental arm of Van Dieman, you can expect to have your taste buds challenged with boundary pushing beer styles…this isn’t your Dads craft beer, be prepared to be delighted. As beer drinking venues go in Hobart, this has to be right up there with the best! They serve a dozen beers on tap, everything from their milder Cream Ale, to their big and ballsy barrel aged stouts. Head Brewer Scott is from Colorado and his beer are heavily influenced by his experiences in his home state. I for one love his Colorado IPA, but you won’t be disappointed with any of his beers! They also do live music, food vans and huge fires! Beer to try: Get a tasting paddle! The HBC Brewers. They look cold? Not sure why they aren't outside beside their huge fire pit? Credit: Hobart Brewing Co. This one might be a good family day out, if you wanted to catch the ferry to Bruny Island and treat yourself to amazing beer and cheeses…or head into the Salamanca Arts Centre to find their shop. Either way, you will be treated some beers brewed the old way…very hands on. Beer to try: Without a doubt, it has to be their Whey Stout. These guys have a great venue in a very popular part of town that is home to many great bars and restaurants. With 10 taps, there is always something new and interesting flowing through them, and a nice warm wood fire in the colder months! Beer to try: Barry White Robust Porter…I’m a sucker for a good porter. Did I mention they serve up some pretty cool food, too? Credit: Shambles Brewery. So there you go, my favourite Tassie brewers. Of course, there are many more dotted around Tasmania, in places as far and wide as New Norfolk (E﻿﻿leventh Order), Railton (Seven Sheds), Ranelagh (Church Hill) and Four Mile Creek (Ironhouse). And of course, I couldn't write about Tassie Brewers and not mention Moo Brew...but I am tipping you have all heard about them and tried their fantastic beers? Anyway, if you find a Tasmanian made beer on your trip, give it a try, you wont be disappointed! Oh, and if anyone wants to give me advice on WA breweries, let me know…my brother in law is moving to Perth just in time for us to take advantage of these new flights, so I will be craft-jacking yet another family holiday! Cheers to great Tasmanian beers.